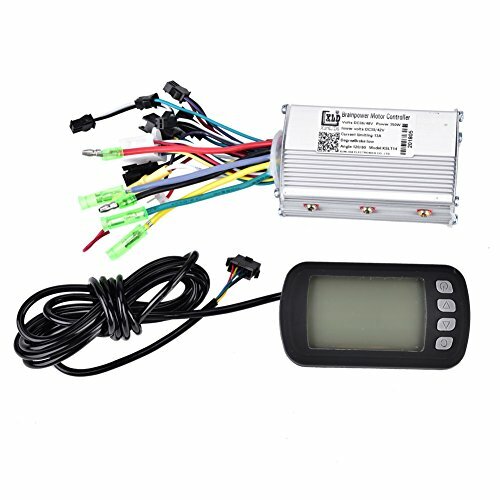 ELECTIRC BRUSHLESS CONTROLLER:Rated working voltage: 36V/48V;Rated power: 350W; Max current: 13A. HIGH QUALITY:Aluminum shell with groove design ensures good heat dissipation and high temperature resistance ability, which provides better protection for inner circuit. FEATURE:It allows steady and sensitive speed control of braking and direction changes.The wires and interfaces have good contact, and ensure low malfunction for long time use. LCD PANEL:Equipped with LCD panel, and it supports multiple setting functions, such as riding speed display, battery status, 5-gear power assist adjustment and more. WIDE APPLICATION:Perfect accessory for electric bike, scooter,etc. Bringing you a more comfortable riding experience.